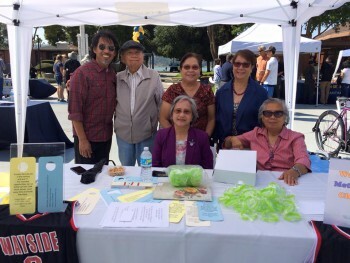 Here is Wayside’s table at Cal Maritime Academy Welcome Students’ Day on August 26, 2015. We’re glad to have the opportunity to meet students and people to let them know about our church. We support and serve outreach projects in our local community. The Christian Help Center in Vallejo and the Benicia Action Council, both of which address the needs of the homeless and hungry, receive our volunteer and monetary support. We support the Salvation Army food closet through donations of food and monetary contributions. We support the California Veterans’ Home in Yountville through the “adopting a vet” program and through the donation of personalized Christmas gifts. We donate new children’s clothes to the Shriner’s Hospital in Sacramento and to the David Grant Medical Center at Travis Air Force Base in Fairfield. We believe God’s love is best expressed when people take practical action to share the good news with others by their support and service.